Peat has been used as a form of energy for at least 2 000 years. It was useful as an alternative to firewood for cooking and heating in temperate and boreal regions of Europe, in particular Ireland, England, the Netherlands, Germany, Sweden, Poland, Finland and the USSR. The increasing use of gas and oil as cooking and heating fuels during the 20th century resulted in a diminishing use of peat for such domestic purposes. The high demand for electricity, however, locally stimulated the development of large electric power plants fuelled by peat. Peat appeared especially competitive in the 60-200 MW power plants which necessitated the reclamation of vast areas of peat for large scale peat extraction, particularly in Ireland, Finland and the USSR. Specialized technology was developed for these reclamation efforts. Recently, peat has been used for electricity generation in small units in the range of 20-1 000 kW. As well as these energy uses, peat is mixed with mineral soil in horticulture to increase the moisture holding capacity of sands, to increase the water infiltration rate of clayey soils, and to acidify soils for specific pot plants. Industrial uses include the extraction of valuable hydro-carbons (Table 31), and in the building industry it can be used as an insulator because of its poor heat conducting properties. Such uses are however relatively minor in relation to the large scale extraction for energy purposes on which this chapter concentrates. Extraction of peat for energy purposes as an alternative to relatively expensive imported fossil fuels such as oil and natural gas, has become particularly attractive to developing countries since the first fuel crisis in the nineteen seventies. There often appears to be a strong natural link between the extraction of peat for fuel and agricultural development. The latter either succeeds extraction when the peat deposits are exhausted or both enterprises are carried out simultaneously. It is likely that in the near future it will become possible to employ very small generators fuelled by peat for water control and water-table management in peatswamps used for agricultural purposes. If this can be done it would perhaps be economical and, from an income-generating point of view, desirable to stimulate integrated development of peatswamps. Peat extraction is only one land use option for peatswamps and often competes with other land use alternatives such as agriculture or preservation. In places peat extraction is desirable where the underlying mineral substrate is of good quality for arable use. The economic viability of peat as a fuel depends on local conditions including availability of other fuels, labour, material costs, transportation distances, climatic conditions and the possible scale of operation. Peat utilization can have socio-economic impacts on rural areas and this should be considered during the land evaluation process which includes future agricultural uses of reclaimed wetlands. A discussion of the issues in the development of peatswamps for extraction therefore forms part of this Bulletin. The technology for peat extraction in the tropics is limited and must rely on the wealth of information from the developed countries, mainly in temperate regions, where peat extraction has been practised for centuries. For up to date technical information reference has been made to studies carried out by Ekono (1981), Bord-na-Mona (1984) and Euroconsult (1984 and 1985). The following sections describe the concepts and principles of evaluating the quality and quantity of peat resources, the planning of peat production, and finally the preparation of peatswamps for extraction and the related problems. Peats vary greatly in character partly depending on the state of decomposition of their plant remains and for this reason the Von Post scale of humification is commonly used to characterize peats (Table 16). Weakly decomposed peat is poorly suited to combustion, and therefore peat should be at least moderately decomposed (group H5) for use as a fuel. The carbon and hydrogen contents of peat are significant for its use as a fuel. During decomposition carbon and nitrogen typically increase whereas oxygen and hydrogen decrease (Table 32). However, relative amounts of the various organic compounds in peats such as carbohydrates, humic acids, lignin and bituminous materials (Table 12) affect the intensity of the three phases of combustion commonly distinguished in thermo-analytical studies. Inorganic substances in peat deposits vary quantitatively as well as qualitatively and they affect the ash content which is a useful parameter when assessing the value of peat for fuel. Peats with a large content of mineral soil have a high ash value. The range of ash values in good quality peat is from 1-7 percent, but peats with values up to 14 percent are used for fuel. Analyses of some Indonesian peats are compared with those of peats from Finland and the Netherlands in Table 33. These figures show the wide range of ash values that can be present in the same areas, probably caused by admixtures of mineral soil. 1 Moisture content is as received and is not representative of the bog as a whole. 3 Samples analysed by Shell Laboratories, Amsterdam. 4 Samples analysed by PPTM-Bandung. 5 Samples analysed by Ekono, Finland. Proportions of SiO2 and Al2O3 which raise the melting point of the ash often exceed 50 percent of the total ash content. CaO and Fe2O3 tend to lower melting points. The sulphur contents of peat is usually low (0.1-0.4 percent as indicated in Table 34), although according to Table 13 values can be as high as 4 percent while Indonesian peats vary between 0.03 and 0.74 percent. Most peat therefore has a sulphur content comparable to oil which has a content of no more than 0.3-0.4 percent. This in turn is much lower than the sulphur content of coal and lignite (1-3 percent). Peat is therefore environmentally as acceptable as oil for use as a fuel. Three types of commercial peat are commonly distinguished: milled peat having a moisture content of 40-50 percent, air-dried sod peat with a moisture content of 30-40 percent and, artificially dried compressed peat briquettes with a moisture content of 10-20 percent. Milled peat is commonly produced by large scale mechanized peat extractions, whereas the other two are produced on a smaller scale by manual, semi-mechanical or mechanical methods, either in dry or in wet conditions. Milled peat is a heterogeneous mixture of loose peat particles which are cut from the surface of the peatswamp. The particle size, which varies with the production method, peat type and degree of decomposition, is between 3 and 8 mm. The peat is cut at 0.5-2.0 cm depth, spread uniformly across the surface of the peatswamp and allowed to dry in the wind and sun. Because of its low bulk density and relatively high moisture content, the calorific value of milled peat per unit volume is low, restricting its economic transport distance. Air-dried sod peat is a manually or mechanically compressed fuel. The size and shape of the product, which may be either cylindrical or brick shaped, is dependent on the production method. Hand-cut sod peat is about 125 x 125 x 300 mm (Plate 12), whereas mechanically produced sod peat is 10-30 cm long and 5-10 cm, in diameter. Compression takes place during production and the sods shrink further and harden during air-drying by the wind and sun. Air-dried sod peat has a higher calorific value per unit volume than milled peat and can therefore be transported more economically. Artificially dried and compressed peat briquettes or pellets are uniformly sized and thus easier to handle than either milled peat or sod peat. Milled peat is mechanically compressed to form the briquettes which are similar to bricks in size, whereas pellets are 3-30 mm according to the machine used. The milled peat raw material varies in moisture content from 40-55 percent and must be artificially dried to between 10 and 20 percent to produce either briquettes or pellets. The calorific value of both briquettes and pellets is high per unit volume and they can therefore be transported economically over longer distances than either sod or milled peat. The combustion properties of commercial peats can be determined from their moisture content, their bulk density, their calorific value and their volatile substances. Table 35 lists these properties for the three forms of peat in comparison with wood and lignite. The moisture content of processed peats is variable and this influences their combustion properties and calorific values. Manufacturers try to keep stockpiles at a moisture content of 40-55 percent. Internal heating of the stockpiles usually starts at 50-100 cm depth and the moisture content can then drop to 10-20 percent. Internal heating can occasionally result in spontaneous combustion which can be prevented by cutting off the supply of oxygen either by covering with plastic sheets or by enlarging the stockpile. In the tropics internal heating and spontaneous combustion are considerable problems. The bulk density of milled peat is low and depends on the stage of decomposition of its fibres (86-212 kg/m3 in Finnish peats). Compression which usually occurs on stacking is partly reversible when the weight is removed. The calorific value per unit volume of milled peat is in the range 3.35-4.19 GJ/m3 and is only one quarter to one sixth that of coal and about one tenth that of oil. The calorific value of peat dry matter is primarily dependent on the type of peat, degree of decomposition and ash content. Figure 30 illustrates the relationship between moisture content, ash content and calorific value. The calorific value of oven-dried peat is generally about 20 MJ/kg, but at the operating moisture content of 30-40 percent the calorific value is only about 10 MJ/kg. On this basis an estimate can be made of the total energy value of a peat deposit of known volume assuming a certain bulk density and field moisture content. For comparison the average effective calorific values of different fuels are given in Table 36. Particle-size distribution and flow properties affect the fuel properties of peat. Optimum size-distribution is not known but dust must be avoided as it creates unhealthy working conditions and may self-ignite. The proportion of the fine material in peat should therefore be low. On the other hand coarse fractions and fibric materials cause handling difficulties and therefore a high proportion of medium sized particles seems favourable. For this reason the best peats for fuel are probably those with moderate decomposition (mesic peats). Particle-size distribution should be considered in relation to bulk density and air space as large air spaces favour internal heating in the pile. Resources are estimated during an initial survey. When assessing the peat for energy purposes, the following properties should be assessed: degree of decomposition, depth, amount and size of wood fragments, nature of underlying deposits (with a view to land use after extraction) and feasibility of drainage. Samples are taken for analysis to determine the properties shown in Table 33. Loss on ignition should also be measured to help interpret the values obtained for ash content. While the physical conditions of the peat and the peatswamp are important considerations during the initial survey, assessment should also be made of factors such as the climate, accessibility, socio-economic and environmental impact of the extraction as part of the economic feasibility. Peatswamps have to be drained prior to extraction and there needs to be adequate conditions for drying the peat production. Meteorological data on rainfall amounts and distribution, evaporation, sunshine hours and radiation, will show the best periods during the year for drying. In addition to the excess rainwater which must be drained from the peatswamp the equivalent of 180-190 mm of water must be evaporated from the drying beds during one drying period. Tropical areas, particularly those in the wet equatorial belt, have a high annual rainfall, often in excess of 3 000 mm, and there is no pronounced dry season with rainfall of less than 60 mm monthly. Nevertheless, peat can be dried quickly even under such a wet climate. Supardi (1983) found that under these conditions sod peat can be dried to a moisture content of 15-20 percent in a relatively short time (Fig. 31). Once irreversible drying sets in, which occurs within a few days, heavy rainfall has little effect on the peat sods. In Jamaica preliminary trials, however, indicated that a drying period of 30 days in the dry season was needed to reduce the moisture content from 90 percent to 35-40 percent. 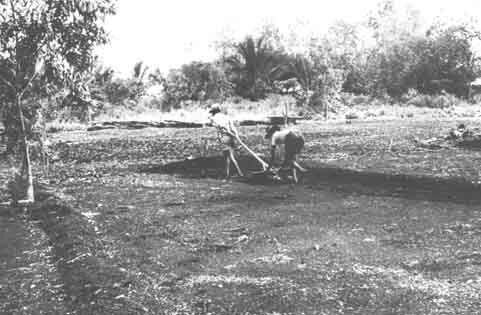 In the wet season, when 20-50 mm per day is not uncommon, it proved impossible to dry sod peat below 50 percent moisture (Robinson 1980). Climatic studies should therefore always be followed by field trials. Many of the factors influencing the practicalities of drainage are studied during the initial survey. The outfalls through which drainage water will be removed require investigation as does the possibility of intercepting or damming external water and avoiding unwanted mineral sediments. These factors depend to a large extent on the water regimes of local rivers, creeks and swamps. The water regimes have to be analysed from hydrometric data and a hydrological evaluation of the terrain undertaken. On this evaluation depends whether a system of dry excavation or wet excavation (dredging) is adopted. Because of the large volumes of peat to be removed, accessibility is a more important consideration in peat extraction than in reclamation for agricultural development. In many cases access by water is the simplest method but the need for navigation should not interfere with water control measures. Roads serve a useful purpose but their construction is often difficult because of the difficulty of building foundations (see section 7.2). In mountain peats, roads are probably the best solution as there are sufficient quantities of earth-fill readily available. This factor is again emphasized because it is frequently forgotten in feasibility studies. In order to fully evaluate the site, information must be gathered on the potential agricultural suitability of the mineral substrate and the water regime that will prevail after peat extraction. Problems of land tenure and resettlement before and after extraction need attention. In many countries peat extraction is legally regarded as mining and as such can cause land ownership problems. A possible influx of labour by migration of population must be given new employment once peat extraction is exhausted. These long term effects require proper evaluation. The environmental aspects of peatswamp development are an important part of any feasibility study and are dealt with in detail in Chapter 10. The raw peat which may contain as much as 95 percent water, must initially be drained to release as much free water as possible and to give sufficient bearing strength for the peat to carry men and machines. The peat surface is cleared of vegetation and is cambered to give run-off and to provide an area on which the processed peat can be dried by wind and sun. The spacing of the drains depends on the production method, but lies in the range 15-50 m. Drained bogs usually have a moisture content of 89-91 percent. When the peatswamp is sufficiently drained production can commence. In temperate regions this takes 5 to 7 years. Under a hot tropical climate the initial drainage period could possibly be much shorter. There is as yet little experience but there are indications that a 2 year drainage period might be sufficient. Traditionally peat has been cut by hand and was labour intensive. Mechanical production started in the mid-19th century when Hasselgren developed a moulding machine to improve sod peat quality. As greater quantities of fuel were required, technology was adapted and modified in the various peat producing countries to suit local climatic conditions and peat types. Today, while peat production is still carried out by hand locally, it is often a capital-intensive and highly mechanized process which is cheaper than either deep coal mining or oil production. Since the majority of tropical peats are mainly derived from trees and contain partly decomposed logs, branches and roots, the wood content is higher than in most temperate peats. Although wood content varies locally depending on the stage of decomposition of the peat, new mechanical methods of extraction will have to be developed for such materials. Preparation of peatswamps for extraction includes the following stages; surface clearance, ditching, clearing of stumps and the formation of the cutting area according to the extraction methods to be used. All timber, including the crowns of trees, are gathered and removed by methods described in section 7.2. The trunks can be used for making the rafts for road foundations. Other woody materials can be made into chips if there is a local market. Burning should be avoided. In most of Europe, the first stage in any peat development is drainage which is carried out by various types of ditchers. Usually 70 hp tractors are used with a ditching unit attached. The tractors often have tracks rather than wheels to reduce bearing pressure. Hydraulic excavators are used in both temperate and tropical countries. In Indonesia they are used in conjunction with manual cutting of hard timber fragments. Chain-saws, used widely for forest clearance can replace the hand-saw for these large logs. Although this method is slower and more labour intensive than the use of ditching machines, it is nevertheless equally successful. In general, the draining and ditching of tropical peats appear to be more difficult than in temperate countries. Often the machinery used is poorly adapted to tropical conditions. Some Burundi peats are exceedingly difficult to drain by conventional methods because the water levels of the main drainage outlets are often much higher than the bottom of the swamp to be drained. Pump drainage as developed in the Netherlands is needed. The large amounts of contained wood (Plate 9) provide good fuel but where it is in large pieces it can damage the extraction machinery. Where peat is dug by hand this limitation does not apply, although the removal of large fragments from the fine-textured peat is very time consuming and may be prohibitively costly. Small trees and branches can be crushed into the peat layer to a depth of 40 cm using deep millers. This mechanized removal of wood on a large scale however is still to be tested under tropical conditions. Heavy timber can be removed by a stumpdrag, mounted on a digging machine. Such a drag can clear to one metre depth at a time. The large amounts of timber lifted from a tropical peat may cause storage and/or transportation problems if the materials cannot be used locally. Burning is not a satisfactory alternative. During the nineteen twenties and thirties a system was developed in the USSR to produce hydro-peat from bogs containing large amounts of wood. The system consisted of flushing the peat with pressurized water which transformed it into a viscous but fluid slurry. The slurry was carried or pumped to drying pans and spread out in a uniform layer of prescribed thickness. Peat sods were then made when the slurry dried. The system is no longer used in the USSR, but is still used in Sweden (Lindström 1980). In temperate countries there are wood shredding machines able to handle the woody peat. However, their efficiency in dealing with tropical peat containing bigger quantities of harder and larger fragments of timber must still be assessed. The nature of the peat and the climate of the swamp are important factors to be considered when deciding on the method of extraction, the type of peat to be produced and consequently the size and layout of the extraction field. In tropical countries both climate and peat type differ from those in temperate regions where the extraction systems have been developed. Stockpiles of sod peat are commonly located where there is easy and economic access to them and hence the location changes as to whether the ground is frozen in winter or not. In Ireland storage systems are therefore different to those in Finland or the USSR where the climates are much colder. Where sod peat is to be extracted by hand the development of the peatswamp is easy. It is important to install a drainage system usually with field drains at say 20 m intervals. It is sensible only to drain deeply (down to 1.50 m) in areas that will be excavated within about 5 years of drainage. Disregard of this rule enhances decomposition and the risk of fire. After completion of the initial field preparation for the first 5 years of extraction, drainage should be recommenced after about 3 years allowing 1 to 2 years for workable conditions to develop. After the first 1 m layer has been cut, it is possible to deepen the drainage and cut the second layer. Only where it is impossible to lower the water-table so that extraction must be done by dredging is it possible to waive provision of drainage 1 to 2 years ahead of excavation. Sod peat production can be carried out as described below and as shown in Figure 32, the tools used are illustrated in Figure 33. The surface layer of variable thickness (30-60 cm), commonly contains undecomposed roots and plant remains so is not suitable for sod peat production. It is therefore removed in strips one metre wide, and placed on the side of the secondary drain (Fig. 32B). Sod peat is then excavated with a special cutting tool producing a pre-arranged size of sod, generally about 40 x 10 by 10 cm thick. The cut sods are placed on top of the original surface layer placed on the side of the drain (Fig. 32C). When the one metre strip has been cut down to a depth of about a metre the next layer can be cut. 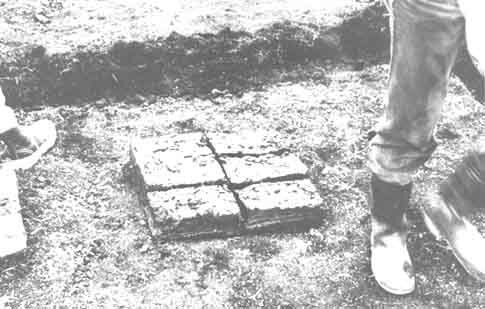 When there is sufficient space created in the widening drain the original surface layer can be dumped at the bottom of the drain and the sod peat placed on this (Fig. 32D and E). Layers of sod peat should be loosely packed to allow air-circulation for rapid drying. This may take 4-5 months under temperate conditions but the experience in Rwanda has been that 2-2.5 months is enough. Local climate is of considerable importance but to speed up drying the piles can be turned after about 3 weeks. Mechanized systems of dry sod production are varied according to local conditions, and there is no experience of them in the tropics. Treatment here is therefore brief but a few principles must be given. Drainage should be installed about 2 years before excavation. Climate, especially rainfall, influences the length of this period. The surface layer must be removed as in the manual operated system but the surface must be levelled. The levelling can be done by the same machines which carried out the ditching. Extraction is usually carried out in strips 20-40 m wide, which are drained by open ditches 1.0-1.3 m deep. The peat should not be allowed to become too dry prior to excavation because it can slow or stop the machines. However, machines seldom have the power to cope with moisture contents over 83 percent. Peat should have a value greater than H5 on the Von Post scale. Well humified peat (H9 and H10) produces sods which crumble easily and therefore these peats, which produce excellent fuel, are best excavated by the milled peat system. Mechanization requires high capital investment and is only cost-effective in large scale extraction. Production of 20 000 tons is possible in about 300 working days using machines which would take 30 000 man days manually. Removing wood fragments is the main constraint to mechanized production so the semi-mechanized field press system is probably the most feasible for tropical peats. In this system the peat is dug out by a hydraulic excavator and put into a towed field press machine powered by a 60-80 hp tractor which must have a crawler gear. The field press is towed by the tractor to a level storage area, away from the excavation site. While travelling, an agitator in the press, operated from the tractor power take-off, breaks up and macerates the peat. At the storage site a screw arrangement in the press, again operated by the power take-off, extrudes the peat through a rectangular orifice and spreads the sods on the ground behind. A sod marker marks off the sods into 375 mm lengths. The hydraulic excavator can if necessary be replaced by manual digging of the peat but in both cases timber must be removed. The woody nature of tropical peats may be the major constraint in peat production particularly for developing fully mechanized systems. In manually operated systems, shallow drainage is only required for preparing the drying site. The peat is dredged manually by using buckets or tins, the material is thereafter thoroughly mixed and spread over the drying beds in a layer 20-25 cm thick. After initial drying, the peat mass can be cut into blocks of required size and piled-up for further drying. This method requires a large area and is very labour intensive with about 100 kg of dry turf produced per man/day. In mechanized capital intensive systems, the traditional bagger is widely used. This excavates the peat to a depth of 2-7 m, macerates it and spreads it out to dry. Other methods include screw cutters, which excavate the peat with a 40-130 mm diameter screw cutter making a 400-1 000 mm deep angled cut into the surface. It macerates the peat and extrudes it behind the machine. Neither of these machines operates efficiently where the peat contains a lot of large hardwood fragments. Where this occurs major modifications are necessary. Disc cutters, however, use a disc 900-1 400 mm in diameter to excavate the peat from a 400-600 mm cut. They cut through wood and fibres and thus can be used on woody and fibrous deposits. The main constraint in fully mechanized wet production systems is the large drying areas required. A rule of thumb is that 1 tonne of dry peat needs 75 m2 of drying space under average drying conditions. Under ideal conditions the area needed is less (15 m2). Further, the peat should be of homogeneous quality and not contain clay lenses. Dry sod systems are therefore better suited to relatively small areas. The top 0.5-1.5 cm layer of peat is milled or pulverized in beds commonly 20-40 m wide but up to 3 km in length. The milled peat layer is mixed and turned by spoon harrows until the harvesting moisture of 40-50 percent is reached. The number of harrowings necessary obviously depends on the weather, 2-3 days is commonly sufficient, but in unstable weather it can take weeks. The milled peat is collected into one pile or ridge in the centre of each field. The peat is put into stockpiles. Three methods are used, the Peco, Haku and Harvester methods (Fig. 34). a. In the Peco method, the peat is first collected into ridges along the length of the fields at 10-20 m intervals. The ridges are then moved sideways by a self-loading 10-20 m long transporter onto stockpiles at 100-400 m intervals. Stockpiles can be as long as 0.5-3.0 km, depending on the length of the fields, and are 4-6 m high but having a small cross-section of 20-40 m2. The milled peat can be transported to the margins of the bog by special vehicles or a narrow gauge railway. b. In the Haku method, the ridges are loaded by Peco type transporters on to bog trailers and carried to stockpiles which are often sited next to a road. These stockpiles can have a volume of 10 000-50 000 m3 with a height of 15 m. Because of tight compaction the temperature seldom rises over 50°C and the risk of fire or self-ignition is low. Tropical conditions will no doubt give a higher fire risk than that prevailing in temperate regions. c. The Harvester method uses self-loading trailers or harvesters to collect the peat and carry it to stockpiles at the end of the fields. Stockpiles are smaller, 6-8 m high and with a volume of 2 000-3 000 m3. Because the material is loosely piled there is a danger of internal combustion. The choice of harvesting method depends on the peatswamp, peat quality, demand and type of machinery available. Harvesting can also be carried out pneumatically and in this case 5-15 ton/ha can be harvested daily in thin layers from the dry upper part of the milled peat. The economic feasibility of each method should be assessed for each swamp individually. Milled peat is commonly used for fuelling large power stations of up to 120 MW and as a raw material for briquettes. The number of harvests a year depends on the climate. In Ireland, where there is an annual production period of 4-5 months there may be 12 harvests, while in Finland with a shorter but consistently drier production period 16 harvests may be collected. In the tropics there would undoubtedly be many more. In the experience of the author, good milled peat could be obtained after only 3 hours of intense drying in Kalimantan, Indonesia. The scale at which milled peat must be produced at these drying speeds is an obvious constraint. In contrast with manual and semi-mechanized sod peat production, which are labour intensive, milled peat production requires high capital investments. Manually-produced milled peat may be recommended in tropical regions where the supply and cost of labour is not limiting (Plate 13). a. Wood contents of up to 50 percent as in the coastal lowland oligotrophic peats of West Kalimantan, Indonesia. b. Unstable weather making mechanical harvesting uncertain. c. Self-combustion. In the tropics moisture content of the peat may fall below 40 percent, which may cause the peat to disintegrate into dust. This material can explode when reaching the power station. In connection with peat extraction there remain a number of issues to be discussed related to the planning of present and future utilization of peatswamps. Some brief remarks on the relevant basic considerations are made. During the planning of peatswamp development choices have to be made between the various possible uses. Firstly, peatswamps can be reclaimed for agriculture, for peat extraction or for a combination of the two. Secondly, it is possible today to develop peatswamps for peat extraction followed by agriculture on the cut-over peatland. A third possibility is to opt for preservation in the natural state or to abandon the cut-over peatland and let it revert to near-natural conditions, and the possibility of renewed peat formation. Any plan using these options should be considered in relation to national economic factors. Extraction causes rapid diposal of peat. Under agriculture slow disposal is usual. The view is held that since peat will, in time, decompose, oxidize and disappear when used for agriculture, why not profit from it by excavating and selling it. Such views are justified if the underlying mineral substrate produces soils of excellent quality for agriculture, and present day economic factors are overruling. It is further justified if the peat is oligotrophic so that fanning will never be economic. However, the physical conditions of the cut-over peatswamp may be such that drainage required for agriculture will be difficult and costly to provide. Therefore before such a decision is taken the feasibility of these options should be carefully studied. Extraction of peat will either be subsequently followed by agriculture or not depending on the nature of the underlying material and the hydro-topographic conditions prevailing after extraction. In the case of planned agricultural developments after excavation it is important to consider leaving a certain thickness of organic materials over the mineral substrate. This is particularly necessary when substrates are infertile sands. The incorporation of decomposed organic material into the coarse textured mineral materials will improve structure, water holding capacity, and general growing conditions. It may be advisable to opt for high water-tables to preserve the thin layer of peat on the mineral subsoil and in such cases land use has to be carefully chosen. In many of these cases pasture has to be recommended. The natural conditions of peatswamps and their specific locations play a key role in decisions regarding possible land use. Peatland is often associated with remnants of river terraces underlain by infertile sands. In the tropical lowlands of South East Asia this combination is widespread. Coastal peats in lagoons often border infertile dune sands or old beach ridges. Peats here could be used as soil improvers and a peat excavation industry could be created. Transport costs though are high and it is doubtful whether peat contributes much to the fertility of these sands. Irreversible drying of the peat lumps if allowed would not improve structure, whereas oligotrophic peats would not improve the chemical fertility of the sands. Generally in small inland valley peatswamps, surrounded by infertile mineral soils, it is more economical to reclaim the swamps for fodder grass and to use the manure produced by the cattle to fertilize and improve the soils of the neighbouring hills, than to excavate the peat and transport it to the hills. This kind of land-use planning attempts to integrate the potential of both the peatswamp and the adjacent land. Similarly, the large coastal lowland peatswamps of South East Asia are commonly fringed by thin peat and a belt of mineral materials forming river levees. A combination of agricultural activities on the mineral soils and shallow peat coupled with extraction of the peats thicker than 2 m is a possibility. The areas of deep peat after excavation to a minimum thickness of 1 m could be then used for agriculture or silviculture. The sustainability of drainage has an important bearing here. In countries with meagre resources of arable land the agricultural use of peatswamps should take precedence over peat extraction, particularly where located near large centres of population. In such cases valuable arable land is under pressure from urban and industrial sprawl. The reclamation of newly exploited and cut-over peats for agricultural use requires methods which are as yet untried under tropical conditions. In western Europe, cut-over bogs have been brought into cultivation for over a century, but most are of the high moor type where gravity drainage is no problem. Experience, however, indicates that it is highly desirable to leave at least 0.5-1.0 m of peat overlying the mineral substrate, or to incorporate this in the underlying mineral substrate. In the tropics lowland bogs are commonly underlain by potentially-acid sulphate materials, and the soils lack sufficient buffering capacity to neutralize the acids formed. Such conditions should be identified at an early stage in planning. The option to leave peatswamps untouched and in their natural state, or allowing them to revert to a natural state after peat extraction is more appropriately discussed in Chapter 10.